Does tourism always have to be a threat to the environment? Not anymore, claim the promoters of the globally emerging industry of ecotourism. Socially responsible and ecologically sustainable tourism, which could at the same time be profitable for the community, is possible, they argue. Babu Vargese was thrown out of college because he insisted on wearing his hair long. Vargese likes to do things differently. Like running TourIndia, a Kerala based travel agency he founded 20 years ago. His keen interest in nature and people, coupled with a nose for business opportunities led him to innovate with the traditional kettuvallom boats plying in the backwaters of Kerala, converting them into houseboats made from local materials and skill. The idea was to offer tourists a non invasive and unique experience in a natural surrounding, while benefiting the local economy and reviving the age-old craft of boat building. This was six years ago. 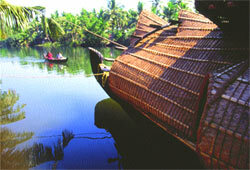 Today, the stretch of backwaters from Quilon to Allepey is teeming with houseboats. With no proper regulations and lack of any policy vision, the houseboats are getting out of hand. The idea, with all the trappings of an ecotourism venture, threatens to destroy the very environment it survives on. Vargese has realised the potential of ecotourism. After his houseboat success, the entrepreneur in him has gone on to team up with the Kerala forest department to create a unique tourism scheme where former animal poachers have turned into tourist guides. His latest ecotourism 'product'? Treehouses, 30 metres high in the rainforests of Wyanad. He is not alone. Often ranked as the world's largest industry, tourism plays a major role in the economies of 125 of the 170 nations in the world. For many countries it is their biggest economic activity. Over 70 per cent of island country Maldives' foreign exchange earnings come from tourism, for instance. 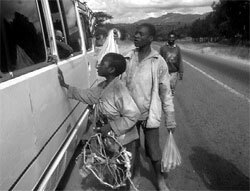 The World Tourism Organisation (wto) estimates that there were more than 693 million international travellers in 2001. Spending by these tourists was estimated at more than us $462 billion, which translates to a staggering us $1.3 billion a day. Tourist arrivals are predicted to grow by an average of 4.1 per cent a year over the next two decades, surpassing a total of one billion international travellers by the year 2010 and reaching 1.6 billion by the year 2020 (wto, 2000). Tourism is the world's largest employer, generating, directly and indirectly, nearly 200 million jobs or some 10 per cent of the jobs globally. In 2001 the industry has suffered because of the September 11 terrorist attacks. For the first time since 1982 (the times of the second oil crisis, martial law in Poland, the Falkland war and the conflict between Israel and Lebanon) the worldwide number of international tourist arrivals showed a slight decrease -- 0.6 per cent or 4 million down from 2000. The fastest growing segment in tourism is nature tourism. wto estimates that nature tourism generated 7 per cent of all international travel expenditure and 20 per cent of all international travel. Today, nature tourism is the largest foreign exchange earner for South Africa, Kenya, Ecuador and Costa Rica. Moreover, while the tourism industry has an estimated annual growth rate of 4 per cent, nature travel boasts of a growth rate between 10 per cent and 30 per cent. The argument is that even a fraction of these revenues, if channelled in the right direction, can go a long way to help the local economy and ecology. In Latin America, anything and everything "eco" boomed after the 1992 Rio Earth Summit. It also reached farcical levels, as in Costa Rica with its "eco-rent-a-car". Mexico boasts of "eco-taxis" and "eco parking lots" because of a few trees planted around the perimeter. Imagine these goals as being three overlapping circles. If a project or service met all three criteria, hitting the bull's eye in effect, one would have unmistakable ecotourism. But what about projects that are just a little off the mark? Are they genuine ecotourism projects? Assuming one wants to know which are the "best ecotourism destinations", the question must follow: how is one to judge? Mexican architect and ecotourism consultant Hector Ceballos-Lascurain, who is given the credit for introducing the term "ecotourism", defined it as "travelling to relatively undisturbed or uncontaminated natural areas with the specific objective of studying, admiring and enjoying the scenery and its wild plants and animals, as well as any existing cultural manifestations (both past and present) found in these areas". The International Ecotourism Society (ties) includes in its definition the improvement of the environment and the well-being of local people; it considers ecotourism to be "responsible travel to natural areas which conserves the environment and improves the well-being of local people". Broadly speaking then, ecotourism is a smaller segment of the nature tourism sector. It demands more than paying a visit to the nature reserve. It demands " responsible " travel so that the impact of the ecological footprint is minimised and the benefits of travel trade are shared, not just with tour operators, but with local communities. This is not easy. But if done, many believe it could be the answer to creating an environmentally friendly -- smokeless industry -- for the many beautiful but destitute regions of the world. The 'eco' boom post 1992 Earth Summit made businesses 'green'. It was also the age of 'green washing' when ecological objectives were fudged for profit. Tour operators became creative and people critical of their travel offerings. How does one tell "green" rhetoric from reality? It's not easy, concludes a new report, Protecting Paradise: Certification Programs for Sustainable Tourism and Ecotourism. The study, written by ecotourism experts Martha Honey and Abigail Rome, finds that with some 100-odd "green" certification and eco-labeling programmes around the world, there is overlap, lack of uniformity and consumer and industry confusion. "Certification is a hot topic, and will get hotter during 2002," states Honey, who directs the Institute of Policy Studies (ips) Ecotourism and Sustainable Development Program. "There is now widespread recognition that certification is necessary to help the responsible traveller and hold the industry's feet to the fire." The certification basically involves assessing a tourism business, including a lodge or a tour operator, or attraction such as beach or park, and awarding use of a logo or seal to those that meet or exceed a set of baseline standards. However, most of these 'green' certification programmes were voluntary and 'market-driven' or based on a presumed consumer demand. Another issue of uncertainty and debate over certification has been the north-south divide. Many, particularly in the global south, fear that these programmes may be used to further enfranchise the most powerful tourism companies rather than to help level the playing field. As Megan Epler Wood, president of ties puts it, "It is difficult to imagine how an international certification programme could appropriately set standards for the ecotourism world, given the number of local concerns." The ecotourists are coming -- and they are willing to pay. So what are these dollar-wielding eclectic tourists looking for? "Destinations don't matter any more, the tourism product or experience does," asserts Rahula Perera, an ecotourism consultant from Sri Lanka. "Ecotourism offers the opportunity to create a new way of doing business." He points to how the Ranveli resort on the western coast of Sri Lanka achieved a turnaround in a couple of years, when it was transformed from a regular beach to an ecotourism venture. Taking advantage of the mangroves in the area, Perera helped the resort brand itself by offering nature trips, including bird watching through its surrounding wilderness. The combined viewing value of marine creatures of the exquisite coral atolls of Maldives are in excess of us $19 million estimates a survey. The viewing value of the reef shark alone may be 10 times the entire export value of all sharks products. In addition, scuba diving alone generated in excess of us $41 million in 1996. This represents average net earnings for each resort of approximately us $0.56 million per year. The country thus has a clear interest in maintaining its fragile ecology. If there is a decline in marine wildlife, the Maldives would attract far fewer ecotravellers and ecodollars. Shark fishing for instance, is a profitable venture and Maldives cant afford to lose it (see box: Sharks and tourism). To avoid diverse cultural impacts from tourism on is conservative islamic society, Maldives limits the tourism zone to uninhabited islands. A survey in the mid-1990s found that tourism had brought many problems as well, from beach erosion to solid waste disposal and coral reef destruction. But because economy and environment are so interlinked in this resort and divers' paradise, the government stepped in to implement policies for sustainable tourism. It has established carrying capacity standards for each island, specifying for instance, that the maximum area that can be developed into buildings is 20 per cent of the island area. There are strict guidelines on construction activity. Sustainable energy production and waste disposal are the responsibility of the island resort. As garbage is the tourist economies' nightmare, a few airlines have stepped in so that tourists who fly to the Maldives in these airlines are given a bag and asked to bring to the airport all the waste they produce during their stay. The airlines carries it to the destination, free of cost. Maldives is learning fast that environment is the basis of their business. The interest in environment is sustained because of tourism. But also, the interest in tourism can only be sustained if there is local interest. This becomes the key to success. In Costa Rica, nature is a tourism factory. Like Maldives, tourism was this small Central American country's top foreign exchange earner, till computer giant Intel set up its microprocessing plant. In 1995 in Costa Rica, the industry generated over us $650 million per annum -- 7.5 per cent of the country's gdp. Tourism has been built on the development of national parks -- in 1996, of the 781,000 visitors from abroad, nearly 270,000 visited national parks. With this economic interest assured, as much as 31 per cent of the country is under the protected area system and now private individuals are finding that it pays to conserve biodiversity for tourists. The tourism value chain is still in favour of the airlines and large and international operators. But nevertheless, a substantial proportion stays within the country and is shared. This has lead to increased dependence and also a vested interest in the trade and therefore, also an interest in protecting the environment. Interestingly, over 70 per cent of the hotels in the country have less than 20 rooms. This means that the small lodges near national parks -- do more than their bit to conserve the environmental resources around. Ecotourism -- built on remote and small-scale nature reserves -- is an opportunity to provide local employment and local economic growth. In this country, everything -- from butterfly farms which export live butterflies, to organic coffee farms, to rich and deep rainforests, to live volcano to river swamps -- are all marketed and sold. Nature is truly a cottage industry here. And a profitable one too. If there is an ideal ecotourism destination in India, it is Sikkim. This eastern Himalayan state of India with its pristine mountains, crystal clear lakes and rich cultural and natural diversity, is fast gaining popularity. Attracting some two lakh tourists a year, of which 12,000 are foreigners, it has witnessed a 15 per cent growth in the past three years. Recognising the potential this sector offers to Sikkim, the Chief Minister Pawan Chamling says, "the enormous biodiversity of Sikkim is for the people. Sikkim cannot afford to have large polluting industries. Along with education, computers (high tech), agro based industries, ecotourism is a way towards sustainable development for us." The State has had a record of taking tough decisions to protect the environment. Tree felling has been severely restricted, grazing has been banned in the reserved forests and attempts are on to make Sikkim a plastic free state. 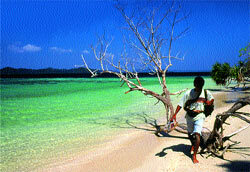 Ecotourism is seen as the developmental option for the future. Inaugurating the South Asian meet on ecotourism in the state capital Gangtok in January this year, Union tourism minister Jagmohan grandly announced, "We want to make Sikkim a model of ecotourism for India and the world." The state government now has a tourism plan, which includes orchid tourism -- over 454 species of orchids are found in the region -- to butterfly parks -- 50 per cent butterflies of the Indian subcontinent are similarly found in Sikkim. "We should target this high value market. Last year, ten groups came from rhododendron societies across the world, spending over Rs 80 lakh," says K C Pradhan, retired chief secretary of Sikkim and a keen promoter of rhodendron tourism. Pema Gyaltsen, from Yuksom in western Sikkim understands the gap between rhetoric and reality. "We don't want the government to dole out tin sheets to spruce up our houses for tourists. The management of land and business remains in the hands of the forest department and tourism industry sitting in Gangtok, Delhi and abroad... We want to know about guest management skills, a greater share in tourism benefits," he demands. Worried that with the rush to the pristine corner of the eastern Himalaya will come with garbage, deforestation and immigration -- and no economic benefit to the local people, Gyaltsen and a group of unemployed youth have formed the Kanchenjunga Conservation Committee (kcc) to initiate a conservation education programme for tourists and porters. The Indian government has also discovered this mantra. The National Tourism Policy, 2002, is eager about development of nature and cultural destinations. It plans to market just about everything -- from coastal resorts and turning Andaman and Nicobar islands into international cruise destinations to traditional cuisines, to "village tourism" to adventure in the Himalaya to wildlife. It parrots the right words about sustainability and community involvement, saying that ecotourism "should be made a grassroots, community based movement through awareness, education and training of local community as guides and interpreters". Minister Jagmohan reiterates this saying, "poverty will be forced to destroy the environment. Unless we tackle the question of inequity, nothing will change. Our ecotourism policy must reflect this goal." States are also following suit. Himachal Pradesh and Madhya Pradesh both have ecotourism policies. According to a document from the Wildlife Institute of India (wii), Karnataka, Rajasthan, Madhya Pradesh and Andhra Pradesh are tinkering with the idea of recycling the entry fees collected from visitors to national parks, for conservation in the park itself. Uttaranchal is fascinated and preparing plans for ski resorts, cave tourism, trekking and even wants to sell a visit to the environmentalist bugbear, the Tehri dam, as a green wonder. But plans are easy to make, difficult to undertake. India's track record in tourism, leave aside nature tourism, is abysmal. According to government documents itself, a majority of tourists visiting India rate facilities -- from roads to accommodation -- as average or poor. No wonder, we get less than 0.38 per cent of the share of tourists of the world. Less visitors than tiny Singapore. It was noted in a conference in Uttaranchal that mindlessness does not make for good tourism. So when toilets are built on the lake or mountain view side and rooms face cement and concrete walls, why should visitors be charmed? In nature tourism too -- the 'tiger tourist' kind -- policy is equally disjointed. The National Action Plan 2002 prepared by the Ministry of Environment and Forests plans to "use increased tourism revenue entirely to augment available resources for conservation". Yet, on the ground, the handling of the increasing tourists in national parks tells an entirely different story. Park management is ill prepared to deal with tourists and without this, tourism is creating new problems -- increasing pressures on the carrying capacity of these protected areas on one hand, and sharpening tensions between the park and the local community, which is not benefiting from the visitor's economy, on the other hand. Take Ranthambore -- a prized tiger reserve in the Aravalli hills. Tourism has boomed here. Big hotel chains -- from the Tata owned Taj hotels to the luxurious Oberois have opened shop here. Many say, this is former us president Bill Clinton's legacy. His visit to Ranthambore has made it a popular destination, attracting according to some estimates over 60,000 tourists last year. Tourists pay phenomenal rates -- from Rs 10,000 to Rs 30,000 a night -- in some of these hotels, which promise a ride into the park for a near certain view of the tiger. Tigers make for good markets. So what does the tiger reserve itself gain from this increased tourist traffic? The economics are simple. Indian visitors pay Rs 25 per visit and foreigners, Rs 200 as park fees. In addition, Rs 200 for a video camera and Rs 125 for a jeep comes to the park. The rest - from hotel rooms, to guides, to jeeps and canters -- a small bus -- stays with the industry. G V Reddy the park director concurs, " We only earn from the park entrance fee. I feel a 10 per cent cess should be paid per tourist by hotels to the park." In the absence of a policy, tourism is adding to pressures of working against conservation. Reddy says they have no legal control over where hotels come up. Hotels are mushrooming in the buffer zone -- area at the periphery of the park. The only control Reddy and his colleagues have is to restrict entry. They have done this by licensing the jeeps into the park so that only 14 jeeps or 20 canters are allowed into the park at one time. The park management signs a contract with the operators, binding them to the rules. But as can be imagined, this has led to a virtual gold mine for the jeep operators and their jeeps are booked months in advance. The money for hiring jeeps and guides is not shared with the tiger they market. Why should it? Contrast this with the National Wildlife Action Plan 2002-2016, which says that "all tourism receipts and the penalties collected in a protected area should go to a local trust fund headed by the park manager. It should be used in the proportion of 70 per cent for community benefit works and 30 per cent for park management and development activity, not covered by the protected area's budget." And what of the local people? The wildlife action plan says, "preference in regular or occasional employment has to be given to local people". Yet, opportunities for employment generated by tourism in Ranthambore, as in most parks, are unevenly shared. Ran Singh, a guide in the park, grumbles, "Hotels employ trained staff from outside and the forest department rarely hires locals for development work or as forest guards within the park. On the other hand local villagers often lose crops to animals from the park." Now, with the entry of the big "outside" hotels, local jeep operators, who ferry tourists within the park, are an unhappy lot too. These hotels are buying their own fleet of jeeps so that they can milk the benefits directly. To conserve the park, local people are faced with severe restrictions on grazing and fuelwood collection, but no benefits. It is not surprising that villagers living near the park feel it is for foreigners only. Their alienation and desperation makes for annual 'battles' between desperate graziers with slingshots and helmet wearing park officials. A bollywood story, with a tragic or happy ending? So, instead of achieving what it was meant to -- sustainable development for all -- park tourism can easily become a nightmare. The story is the same in Nagarhole. There is a long-standing conflict between the tribals, who are being forced to move out of their homes, and the managers of the nature reserve. So when the Karnataka government went ahead and sanctioned an ecotourism hotel project in the forest, a legal battle followed. The Karnataka high court declared in April 1997, "the assignment of a portion of forest land by the state government to the Taj group was in violation of the wildlife protection Act, which prohibits acquisition of land within the national park". Tourism failed. But nothing gained for the tribals as well. The Bhutias around the Nanda Devi Biosphere reserve in Uttaranchal also feel similarly cheated of a livelihood option. Dhan Singh Rana, head of the gram sabha of Lata village on the border of the reserve, explains, "Our people know each pass, each herb and each turn in the rivulets around here. The tourists came and plundered the area. We paid the price for it. We were thrown out of our own lands when the national park was formed." The village wants to be involved in the tourism initiative. Rana explains, "Why should outsiders and middlemen run our trade. The villagers can do it themselves. Nearly all families here have two houses, one at the lower reaches of the hills for winters and the others on higher reaches where we shift to during summers. We can easily use the lower houses as hotels with traditional architecture to accommodate tourists." Sunil Kainthola of Janaadhar, a non-governmental organisation based in Dehradun and closely associated with the plans says, "Give the wherewithal and the village will prosper. If anyone can run the ecotourism on an equitable and sustainable basis, it is the people themselves." In contrast to convention, managers of the Periyar National Park in the Western Ghats of southern India are doing some remarkable and bold experiments by creating tourism products that they hope will not only benefit the local communities but also help the short staffed and poorly funded forest department to achieve their conservation goals. With funding from the Global Environment Facility's (gef) ecodevelopment project launched in 1996, park authorities created committees to work with villagers on creating alternative livelihood options and enhanced agricultural productivity. Members of one such ecodevelopment committee have set up the Periyar Tiger Trail project, which includes 23 former poachers, who previously made a living by trading forest goods illegally. This ecotourism project is a joint collaboration between the Kerala forest department and the ex-vanaya-bark collectors ecodevelopment committee. The former ex-cinnamon bark poachers turned tourist guides' intimate knowledge about plants and animals, and their survival instincts make them ideal guides for ecotourism activities. Besides taking small groups of tourists on foot into the forest, they also assist forest guards in patrolling. The intelligence network of the park authorities has improved tremendously. Poachers have been caught redhanded. One ecodevelopment committee got a whole colony of Uralis (a tribal group) brewing illicit liquor to shut down. A fast regeneration of cinnamon trees is seen in Periyar forests. An unprecedented 89 cases of sandalwood poaching were reported since the scheme was launched. "People are poor. They will poach," points out Amit Mallick, deputy director of Project Tiger, who had a tough time convincing his own seniors about the viability of the project. "We had to convince our own staff. They asked me 'how can we sit with criminals who we were chasing just yesterday?' Trust had to be built on both sides." The returns are coming in. TourIndia -- a private enterprise run by Babu Vargese of the boathouses and tree house fame -- has bid a contract in which he takes on the development of the tourist trade to the Periyar Tiger Trail and pays the ecodevelopment committee a fixed amount of Rs 18 lakh a year. This private-community enterprise is a model worth learning from. The guides earn a salary and in addition, they also collect from tourists a guide fee. These poachers-turned-guides contribute their earnings, which could go up to Rs 6500 per month from tourists, to a corpus for long-term sustainability, after the gef money dries up. By early 2002, they had Rs 26 lakh in their kitty. Their fortunes are changing and so is the respect in local society. One member of the ecodevelopment committee is now the elected panchayat leader. But tensions are also growing as more and more people want to join this guide tourism trade. Forest officials want to create a Periyar Foundation. Eco-development officer Pramod Krishnan says, "a bankrupt state exchequer has meant that we must channelise private funding into conservation and development. We visualise the foundation as playing an important role in providing a sustainable platform for scientists and technical experts to work in tandem with local residents. The foundation shall also be autonomous and a financially viable entity. It shall be jointly owned by locals, private industry and government." Like Ranthambore, here also officials are in favour of levying an eco-tax on hoteliers and tourists as a conservation fee. "It is high time we had a surcharge on hoteliers and individual visitors," says Krishnan. The idea of ecotourism is still at a nascent stage in the country. We are beginning to see the first steps towards any guideline or policies. "Tourism is already happening in all protected areas," acknowledges Rajiv Bhartari of Wildlife Institute of India. "But what we need is meaningful ecotourism which links and integrates all stakeholders." Bhartari, a former park director, is now formulating an ecotourism framework for the Corbett Binsar and Nainital region in Uttaranchal. Not everyone is thrilled with ecotourism. Many believe that the big business of tourism people is only using the people in destinations, who offer their natural, social and cultural resources to make the 'tourism product' successful. In a resolution passed in April 2001, opposing the un-initiated International Year of Ecotourism, equations, an organisation working on equitable and sustainable tourism and other environmental organisations said, "ecotourists, consider the forest a 'virgin' to be raped, or 'enjoyed'. The current rush by imperial holarchies to protect 'virgin tropical forests' cannot but be compared to the feudal practice of reserving the young virgins for the feudal lord. After they are 'despoiled', they are handed back....We the undersigned ngo's and people's movements feel compelled to warn all concerned parties not to skirt the critical issues of ecotourism and the fact that a mountain of money will be spent on projects initiated around the international year of ecotourism in order to boost the industry,". This is the critical challenge. Is socially equitable and environmentally compatible tourism, at all possible, in an unequal and unjust world? Many believe the answer lies in learning from the scattered but growing examples of micro-partnership that are emerging in ecotourism -- between communities, ngos, conservationists and governments. In Peru's southeastern Amazon basin, the Ese'eja, the native community of Tambopata are protecting their harpy eagles and scarlet macaws, both endangered large bird species, while showing them to their visitors. Rainforest Expeditions is Peru's first joint tourism venture between a native community and a private tour company. The native Ese'eja community and Rainforest Expeditions have a 20-year contract stipulating that the company would not interfere with the community affairs and the community must not farm, log or hunt on the approximately 1800 hectares of land that the lodge occupies even though it remains the property of the community. According to the contract, the Ese'eja keep 60 per cent of the profits from the enterprise, have 50 per cent of the decision-making authority and participate in lodge management, marketing and itinerary development. A partnership between the fiercely independent Maasai community of Kenya and a safari operator has emerged the Shompole group ranch and the Eselenkei group ranch in a conservation area not far from Nairobi. Shompole boasts of a six-room lodge built almost entirely from local materials. Its energy meets are met by solar power and water is heated with cow-dung briquettes. The Maasai community has helped to draw up a wide range of safari activities. The project has won significant grant from the European Union to improve roads and train game wardens for the Shompole conservation area. The Eselenkei group ranch, that borders Amboseli National Park and is on a vital migration route for elephants, has a four-tent Porini Camp that the community has pledged to keep free of livestock. Since most ecotourism happens at much smaller scales in terms of numbers, smaller enterprises and boarding facilities play a crucial role. The latest in ecotourism is what is described as 'village tourism', where homesteads are being promoted. A successful experiment involving the local community is the Sirubari Village Tourism Project in Nepal. Tony Parr, consultant, Nepal Village Resorts, says "The basic concept used at Sirubari is one of home-stay packages, where guests live largely as part of an individual family. Apart from improving toilet facilities, no great investment in infrastructure was required." Each household that participates in the project is a signatory of the rules and regulations set down by the village. This way the tourist gets a first-hand experience of village life and at the same time, the community benefits financially. The tourism policy in India too talks about village tourism. But it is really an example of learning from the Alps of Europe, where governments provide financial assistance and subsidy to home owners to convert their houses into bed and breakfast facilities. These homesteads are seen as the alternative to big resort ski-tourism, often called the black gold because of its environmental and social implications. Ecotourism is still not quite there. Nature tourism is definitely booming. But how much of this is "responsible" tourism is difficult to say. The Indian National Tourism Policy sums up the challenge when it says that it wants to ensure that "tourism acts as smokeless industry and ecological footprints remains as soft as possible?" Will policy ever become reality?